Take in the sun at Coppola Winery's new pool club, with stunning hillside views and a poolside cafe. It can be hard to pin down the real Sonoma County. Is it almost-too-cute villages like Glen Ellen or Geyserville? The wine-country hubs of Sonoma and Healdsburg? Santa Rosa, city of business and brewpubs? The hot, golden hills inland or the moody, foggy coastland of Bodega Bay or the redwood-shaded bends of the Russian River? Never mind deciding: we’ll take it all. Wild Flour Bread. The back garden at Wild Flour is just the place to enjoy whipping cream scones and cheese fougasse. The bakery’s wood-burning oven creates a bread with a hard crust and a cult following. $; 140 Bohemian Hwy., Freestone; . Boon Eat + Drink. At Boon Eat + Drink, the busy chef Crista Luedtke serves Cal-bistro specials such as beet salad, and braised pork shoulder over sautéed greens and ginger–orange zest black-eyed peas. Most of what’s on your plate is locally sourced. And as if that’s not enough, Boon Eat + Drink is committed to local drinking, as well, serving only Russian River wines and beer from no further than Mendocino County. $$; 16248 Main St., Guerneville; . Rocker Oysterfeller’s. The Valley Ford Hotel is just far enough from the coast to duck the fog, and its saloon, Rocker Oysterfeller’s, serves oysters on the half-shell pulled from nearby Tomales Bay. There are plenty of other dining options, as well, heavy on seafood but also including classics like ribs and fried chicken. Brunch is not to be missed, either. $$$; 14415 Coast Hwy. 1, Valley Ford; . Central Market. An open, exposed-brick bistro emphasizing organic foods. It’s all delicious, but for a taste of the area, we especially love the simple romaine salad with chopped egg and buttermilk–blue cheese dressing—all local, of course. $$; 42 Petaluma Blvd. N., Petaluma; . Spud Point Crab Company. Often thick with fog, this town is thicker still with chowder, which you’ll find at road stands and restaurants alike. None receives more kudos than the creamy, briny version stocked with clams that Carol Anello ladles at this seafood shack at the harbor’s edge. Her specialty, which simmers in iron pots on an outdoor stove, is the nine-time winner of an annual town-wide chowder contest. $; 1910 Westshore Rd. ; Bodega Bay; . The Girl & the Fig. This casual bistro in a historic building off Sonoma Plaza specializes in rustic, country-French fare, wines and innovative aperitifs (like a ginger basil-tini, or a lavender mojito), cheeses, and small plates. $$$; 110 West Spain St., Sonoma; . Russian River Brewing. More than 15 selections await in the busy brewpub. One of our faves is the offbeat Supplication, a brown ale brewed with sour cherries aged in Pinot Noir barrels. $$; 725 4th St., Santa Rosa; . Mateo’s Cocina Latina. One example of this places’s take on “modern Latin” cuisine: Chef Mateo Granados hand-rolls his crispy tacones, or cone-shaped tortillas, and then fills them with guacamole, carne asada, or chorizo. $$$; 214 Healdsburg Ave., Healdsburg; . Harvest Moon Café. This sweet little stucco-walled dining room sits right on the square, with patio seating behind. Two Chez Panisse alums get back to basics in a short, fresh Mediterranean menu. Remind yourself how good perfectly cooked beans can be, especially topped with stellar homemade pork sausage. $$$; 487 First St. W., Sonoma; . Farmhouse Inn. We love the fresh, luxurious rooms and friendly vibe at Farmhouse Inn, between the vineyards of Sonoma and the coastal redwoods. The restaurant is a can’t-miss and the small spa beautifully redone. Refreshingly, instead of charging for every little thing, the place piles on extras like a big breakfast, a s’mores bar, and a bath-salts bar. $$$$; 7871 River Rd., Forestville; . Bodega Bay Lodge. At this hideaway overlooking the ocean, it’s all about the outdoors. By day, check out a complimentary beach cruiser for wheeling along the paths on the craggy bluffs. Come sunset, take advantage of the backyard’s cozy firepits with teak rocking chairs and binoculars for spotting migratory whales and shorebirds. Soaking in the infinity-edge hot tub beneath the star-studded sky isn’t a bad way to end the day, either. ￼￼￼￼￼￼￼￼$$$; 103 Coast Hwy 1, Bodega Bay; . ￼￼￼￼￼H2Hotel. The more casual, more eco (and less pricey) spin-off of the Hotel Healdsburg, H2hotel replaces the traditional room service and spa with loaner Dutch cruising bikes and an all-purpose “Receptobar” for checking in, caffeinating, and stocking your own fridge. Our favorite touch: room to store and, if necessary, fix your bike in the basement. $$$$; 219 Healdsburg Ave., Healdsburg; . Boon Hotel + Spa. These fourteen old miners’ cabins tucked into a redwood grove have been renovated as eco-friendly cottages that circle a glitzy swimming pool. After a hike, a hot stone massage is just the thing: There are two private massage studios, and you don’t need to be a hotel guest to indulge. $$$; 14711 Armstrong Woods Rd., Guerneville; . Gaige House Inn. The top-end Zen suites are to die for, but our favorite part? A long soak in the tub carved from granite, polished inside to a high, smooth shine. If you decide to leave your room, you just might have Sonoma’s backroads to yourself. $$$$; 13540 Arnold Dr., Glen Ellen; . Ridge Vineyards. How Northern California can you get? The solar-powered Ridge Vineyards tasting room, built from hay and Sonoma County mud, is thought to be the current record holder. Tasting options range from the $5 single-estate pour (perfect if you’re hitting a number of wineries that day), to a $30 semi-private package that includes a wide range of varietals as well as a tour of the eco-friendly wine-making facilities. $; 650 Lytton Springs Rd., Healdsburg; . Gundlach Bundschu. Gundlach Bundschu is the oldest family winery in California and has beautiful grounds. They tour you around the vineyards on an ATV-type vehicle called a Pinzgauer. The wines are delicious, too, especially their Cab Franc and Gewürztraminer. There’s a great poster in the tasting room that reads, If you can’t say, “gundlach bundschu gewürztraminer,” you shouldn’t be driving. $$$$; 2000 Denmark St., Sonoma; . Francis Ford Coppola Winery. 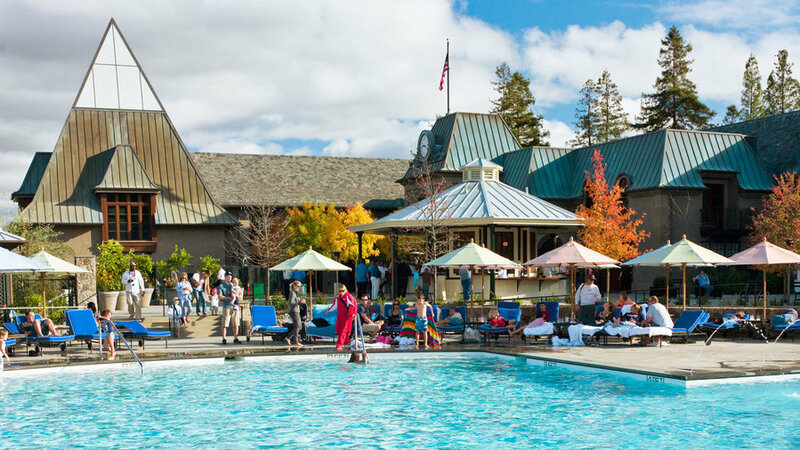 The winery-as-theme-park trend hits its stride at Sonoma County’s Francis Ford Coppola Winery, which has a pool, cabanas, two full bars, and a museum’s worth of movie memorabilia. Nab a table on the terrace for lunch and then—yes—hit the bocce court. $; 300 Via Archimedes, Geyserville; . Matanzas Creek Winery. In the foothills of Annadel State Park, enjoy beautiful views from a tasting room and wraparound deck. The picnic area and extensive lavender gardens make it an idyllic place to spend the afternoon. $$; 6097 Bennett Valley Rd., Santa Rosa; . Joseph Phelps Freestone Vineyards. Two doors down from Wild Flour Bread, Phelps makes a perfect follow-up to a bakery visit. Sit down for a relaxed tasting in the farmhouse-style winery or grab a bottle of Fogdog Chard or Pinot to take home. $$; 12747 El Camino Bodega, Freestone; . Stop by the eco-mod Medlock Ames Wienry for a picnic and sip of rosé at the communal table. Medlock Ames Winery. This is a winery where you want to hang out all day. Inside, it’s eco-mod, with walls of reclaimed Doug fir and windows that open to the patio and vineyards. Picnic and sip rosé at the communal table, while general manager Kenny Rochford fires up the outdoor pizza oven and passes out samples. $; 3487 Alexander Valley Rd., Healdsburg; . Merry Edwards Winery. Don’t let the plain reception room fool you—this is one of the warmer, more intimate tasting rooms in the valley. You’ll likely be guided through a tasting (heavy on the Sauvignon Blancs and Pinot Noirs) by Merry herself , and perhaps graced by a leg rub from one of the vineyard cats. $; 2959 Gravenstein Highway North, Sebastopol; . Jack London State Historic Park. A shrine for lovers of both open space and literature, Jack London State Historic Park includes 26 miles of hiking trails as well as the cottage where London did much of his writing. There’s also a museum devoted to London lore and the haunting ruins of Wolf House, London’s dream home, which was gutted by fire before he ever moved in and remained unfinished when he died in 1916. $$; 2400 London Ranch Rd., Glen Ellen; . Please note that Jack London’s cottage is closed until further notice. All park fees are waived through December 31, 2017. Osmosis. Relax in a fragrant cedar enzyme bath at this spa, or get a rubdown and stroll the meditation garden. Here’s something to think on while Zen-ing out: With a populace numbering under 100, the town of Freestone increases in population by a measurable number of percentage points with every visitor. $$$; 209 Bohemian Hwy., Freestone; . Armstrong Redwoods State National Reserve. Hear that? Absolute silence. At this 805-acre grove of old-growth sequoias just north of town, it’s everywhere. Savor the solitude as you crane your neck trying to find the tops of trees 300 feet tall—and 1,400 years old! As huge as the park is, it’s fairly easy to navigate. Get an eyeful on the mostly flat 1.5-mile Pioneer Nature Trail. $; 17000 Armstrong Woods Rd., Guerneville; . River’s Edge Kayak and Canoe Trips. Based at Healdsburg Memorial Bridge, this outfitter will set you up with a 5- or 15-mile paddle on the Upper Russian River, and you can stop at picnic and swim spots along the way. There’s no better place on a warm day than just floating underneath the bridge. $$$; 13840 Healdsburg Ave., Healdsburg; . Healdsburg Shed. The 10,000-square-foot Shed brings farming, gardening, cooking, and eating together in one glass-walled building. It distills Northern California’s food and wine scenes—with everything from a wood-burning-oven cafe to a fermentation bar with kombucha on tap, from a spot selling local grains (milled on-site) and hand-forged garden tools to workshops, talks, and film screenings. Shed also does Sunday Suppers, a monthly dinner series with local winemakers, farmers, and chefs. $$; 25 North St., Healdsburg; . The Gardener. At The Gardener, you’ll find lots of outdoor furniture and a garden that’ll make you green with envy. The store’s converted barn location and collection of clay pots from three continents are sure to inspire your inner gardener. $$$; 516 Dry Creek Rd., Healdsburg; . Antique Society. Pick up anything from bird-shaped Bakelite napkin rings to a redwood farm table at this vast (20,000 square feet) shop. More than 125 dealers are represented here, making this one of the better antiquing spots in California. $$$; 2661 Gravenstein Hwy. S., Sebastopol; . The Epicurean Connection. A few steps from the Sonoma Square, this market/cafe run by cheesemaker Sheana Davis brims with her hand-chosen, small-batch selections. It’s a task she’s well suited for, as Davis knows not only the local creamery owners but also the goats, cows, and sheep. Our pick: Davis’s own Crème de Fromage, drizzled in local honey and homemade raspberry–rose petal jam. $$; 122 W. Napa St., Sonoma; . Bloomfield Bees Honey. Long before the food-truck frenzy, there were porches where farmers would sell their homemade goods. In Sebastopol, that hasn’t changed. On a stretch of Bloomfield and Pleasant Hill Roads that winds through orchards and vineyards, you’ll spy handmade signs for fresh eggs, honey, and pies, as well as fruits and vegetables. Among the best are Bloomfield Bees Honey, an adorable roadside shed that sells raw, creamed honey and organic soaps and candles. $; 1295 Bloomfield Rd., Sebastopol; . Sonoma Nesting Company. The owners of the Sonoma Nesting Company have feathered their vintage shop with candy-striped dressers, tasseled lamps, surrealist paintings, and other offbeat objets d’art. Buster the pup patrols the courtyard collections, and the gallery is also ground zero for the First Friday Guerneville Art Walk. $$; 16151 Main St., Guerneville; .